For most people, travelling abroad is an opportunity to explore history, nature and tradition, all in the vague hope of returning home a more cultured and well-rounded individual. Sadly, for many of us, this attempt at self-improvement often fails to occur, but, when it does, we can at the very least, return home with a souvenir to say that we tried. Whilst most people would choose a keyring, a fridge magnet, or a ghastly t-shirt that will never again see the light of day, restaurateur Barry Hilton chose to bring home a business plan and a vision. (I bet that was difficult to get through customs). Born out of his love for “food, drink, and sunshine”, Ceru entered into this world as a humble, nomadic pop-up, built to recreate the vibrant flavours of the Mediterranean as it toured around London and the rest of the UK. Over the last few years, they have accrued a significant fan-base, and many would sit and wait to see where Ceru would pop up next. 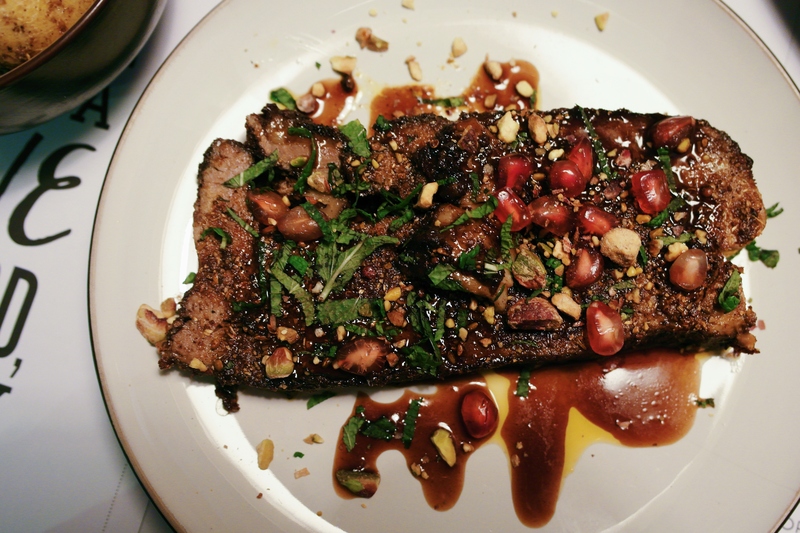 For these loyal stalkers, it will no doubt come as great news to hear that Ceru has finally found a permanent home in South Kensington, and Steak and I decided to check it out on their behalf. The menu at Ceru’s new restaurant revolves around a “mezze dining experience”, and consists of a variety of small sharing plates. If, like myself, you’re used to eating your own food, your friend’s food, and every other customer’s food, the concept of “sharing food” may be difficult to grasp, but rest assured, there is plenty of food to go around. The menu itself includes a number of popular dishes from pop-ups gone by – (or variations thereof), and an array of exciting new additions. 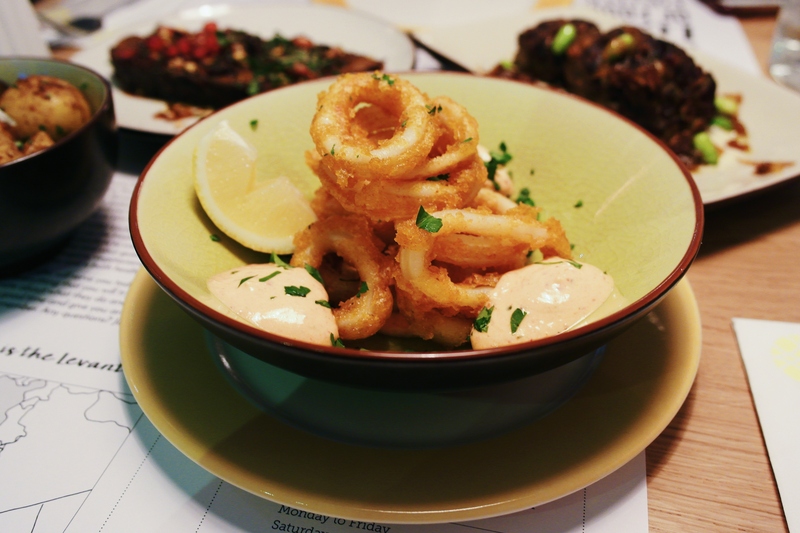 For us, the first item to be devoured was a bowl of battered squid, served alongside a mild harissa yoghurt. The soft rings of squid were covered in a thin, crispy coat of batter, and its subtle, spiced flavour was complemented well by the smooth and creamy yoghurt. 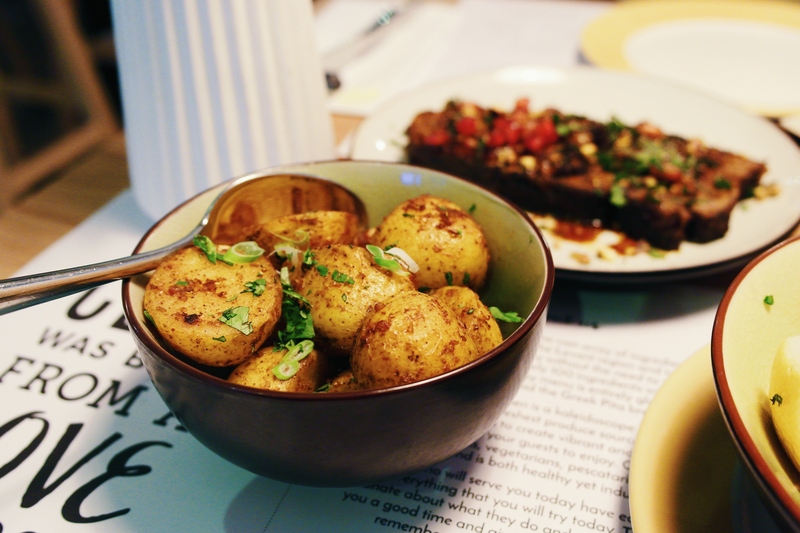 Our side order of roast potatoes also got on well with the harissa yoghurt, and if you do order them both, be sure to dunk away. Next up, was a slice of Ceru’s slow-roasted lamb shoulder – a signature dish that has been with them since their very first pop-up. After being subjected to a respectable five hours of low heat (probably not long enough for the likes of Haloodie Foodie! ), this thick slab of lamb had come to possess a wonderfully heavy, yet tender texture, and put up a minimal amount of resistance to my fork. Each bite delivered a mighty, sharp tang – (owing to the pomegranate and mint sauce), before giving way to reveal a layered and deeply aromatic flavour that swelled and blossomed like an Englishman’s belly on Christmas day. 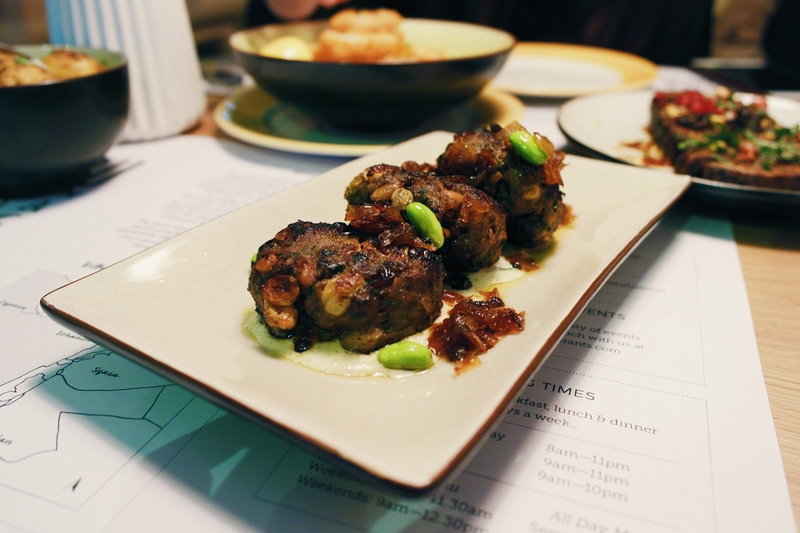 The complexity continued with Ceru’s beef kofte, which was embedded with dried cranberries, lentils and seeds, and was served alongside a helping of edamame beans, caramelised onions and a tarator sauce. The thick and soft kofte carried a surprisingly deep and heavy flavour, which was complemented by the subtle tang of the cranberries, and the incredibly rich sweetness of the perfectly caramelised onions. This elaborate layering of flavours was certainly impressive, but texturally, we felt that there was just far too much going on. Between the beans, the meat, and all the seeds and dried cranberries within it, the kofte seemed a little busy and haphazard, and the texture of the meat itself could not be fully appreciated. As we moved on to the dessert menu, Steak and I debated over a new addition that I had spotted on Halal Girl About Town’s Instagram story. 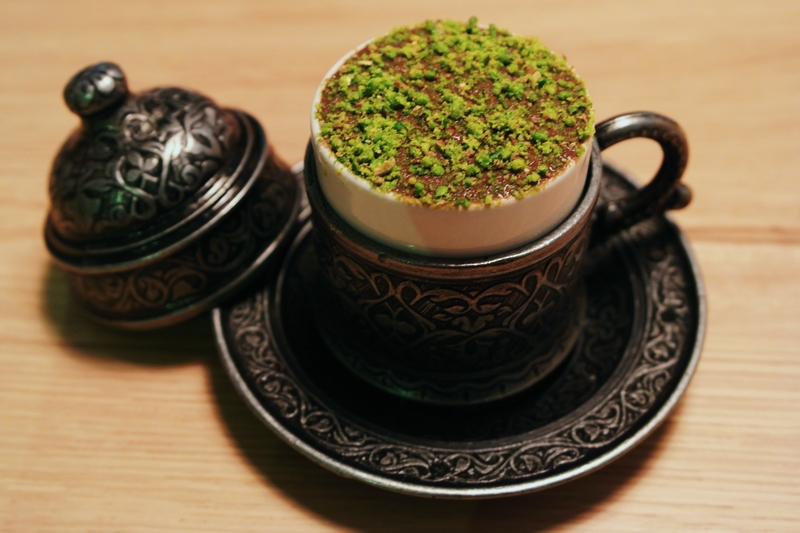 Despite HGAT forewarning us that the “dark chocolate mousse with pistachio and sour cherry” was not as enchanting as it looked, I gave in to my tendency to lose my mind over pistachio, and promptly ordered one to share. The mousse was perfectly smooth in consistency, but to my dismay, its chocolate flavour was nowhere near as “dark” as I was expecting. Instead of a rich and bitter dark chocolate, I discovered a light and smooth milk chocolate flavour, which disappointed my sadistic tastebuds. What’s more, the pistachio crumb added nothing more than aesthetic value, and the soft, bitty texture of the dried cherries at its base just did not seem to belong. Personally, I think this dessert would have been far better executed if it was composed of a concentrated sour cherry ganache / compote and a very dark chocolate mousse, with a thicker topping of pistachio crumbs for maximum contrast in taste and texture. Of the items we ordered, the battered squid cost £7, the roast potatoes cost £3.50, whilst the lamb shoulder and beef kofte came in at £10 and £8.50 respectively, and the chocolate mousse cost £4.50, amounting to a total bill of £36.85 including service. Across the rest of the menu, starters range from £3-£4, whilst main mezze dishes range from £7 to £10, and desserts from £4 to £6. By their very definition, Ceru’s mezze plates are rather small in size, and you will certainly have to order a fair few items if you’re in the middle of an insatiable episode of hunger. As a result, it can be very easy to rack up the bill, and we do feel that a meal at Ceru is at least a little bit expensive for what you receive. (Take the chocolate mousse for example, which was about the size of a legless Richard Hammond). Given how great Ceru’s food is, it would certainly be nice to receive a little more of it per plate. That said, the quality of the food is evidently high, and consideration must be given to the location. Service on the other hand, is worth every penny. Staff members maintained an attentive and personal level of service throughout our meal, and also came by several times to apologise profusely for the noise of the ongoing construction at the front of the restaurant. It’s a small gesture, but it goes to show the level of courtesy that you can expect. For a business that has spent much of its lifetime operating out of shacks and wooden stalls, Ceru has managed to create a rather attractive new home. 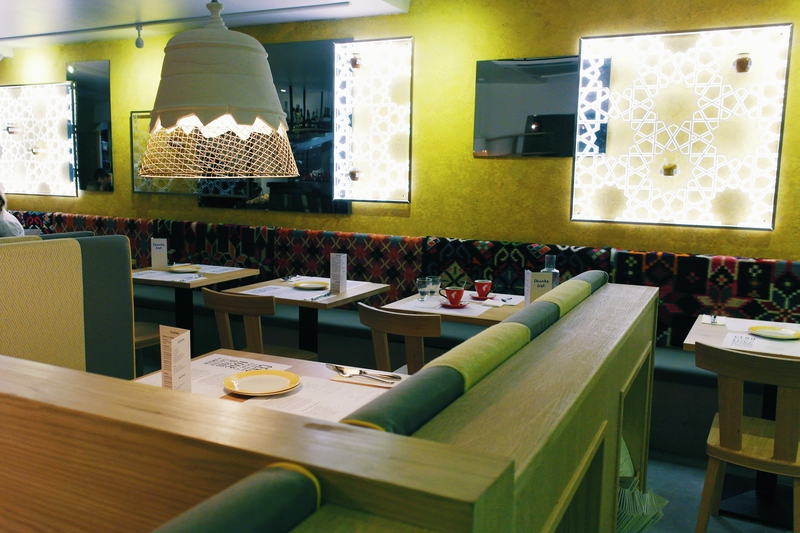 Sand-coloured walls surround a fairly small and cosy restaurant floor, which is furnished with pale wooden tables, chairs, and cosy booths. Overhead, a mixture of rustic and modern light fixtures provide a warm, yellow light that canvasses the entire space, whilst wall-mounted frames emit a bright, ethereal glow nearby. 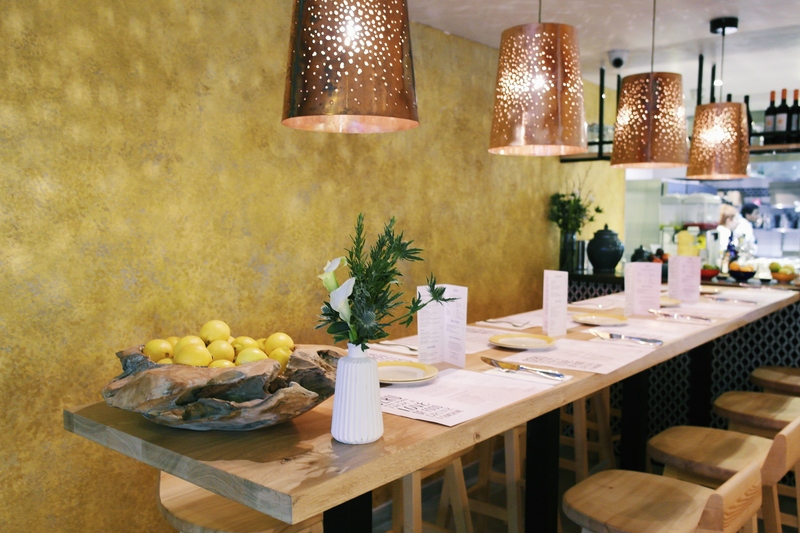 Perhaps it’s the overdose of yellow, but the restaurant really does seem to bring a touch of the Mediterranean sunshine back to the bleak skies of London. As a result, the dining environment feels all the more merrier, and if you put on a pair of shorts and squint really hard, you may just be able to pretend that you’re enjoying a meal on the Mediterranean coast. Alternatively, you’ll get frostbite, but at least your tastebuds will be content. The restaurant itself can be found a few steps away from South Kensington station, and given the lack of parking spaces in the area, public transport is certainly advised. 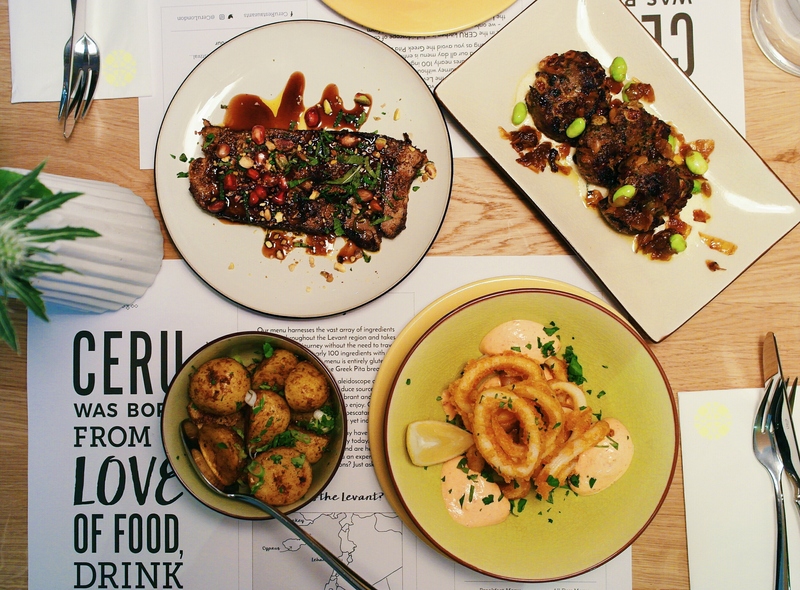 For us, watching Ceru grow from a series of small pop-ups to a now fully-fledged restaurant, has been a rather endearing process – (particularly for Steak, who at 4ft 10, hasn’t had the chance to experience much growth of her own). In all seriousness however, our affections for Ceru lie beyond Steak’s vicarious sense of fulfilment, and instead, within the unique and vibrant flavours that leave their kitchen. London is full of restaurants that faithfully reproduce a particular cuisine from a particular part of the historic Levant, but very few manage to weld these cuisines together, and fewer still manage to do it so well. For this reason, Ceru stands out on the map, and its unique take on traditional Mediterranean cuisine is not to be missed.